Whiplash is a very common injury to the neck usually caused by road traffic accidents. Even if whiplash symptoms are at the milder end of the spectrum, they can still cause the sufferer significant pain, suffering and disruption to life. If you have suffered whiplash injuries in an accident caused by the negligent actions of another, party you may wish to seek personal injury compensation. Successfully claiming compensation can be a complex process and it always helps to have the assistance of an expert solicitor. Here, the Thompsons team answers some of our clients' most common questions regarding whiplash compensation claims. When an impact causes the body to be pushed forward, backwards, or sideways, the neck is forced to rapidly extend beyond its limits (to 'whip' back and forth), and this causes soft tissue damage to the neck. In more severe cases, the ligaments and tendons in the neck can tear or break. What type of accidents cause whiplash injury? In most cases, a whiplash injury is the result of a rear shunt car accident, where one vehicle drives into the back of the other, causing the driver of the front car to jolt forward abruptly. However, soft tissue damage to the neck can occur in any incident involving sudden forces; even a fall can result in a whiplash type symptoms. Can you sustain a whiplash injury in a minor road traffic accident? Even a minor collision can be enough to cause soft tissue damage. In fact, whiplash can be the result of a collision at any speed; sometimes as low as five miles per hour. So, in incidents where your vehicle appears to have been mainly unharmed, you may still have sustained an injury, depending on how your body was affected by the impact. Sometimes, symptoms of a whiplash injury may not be fully apparent until several hours after the accident. So you won't necessarily know the extent of your injury at the scene of the accident. It may not be until you wake up the following morning before you become aware of any injury. The symptom most commonly associated with whiplash is stiffness and pain in the neck, which can be accompanied by inflammation and bruising. But it's not just the neck that can be left feeling the effects; it's also not unusual to feel stiffness around your whole body. If you experience such pain, regardless to what degree, you should visit your GP for a formal diagnosis. Not only will they be able to assess your condition fully, but they'll also advise you on the treatment methods most suited to your symptoms (see below for the best treatment methods for a whiplash injury). If you're suffering from these persistent symptoms, you probably need further medical guidance from your doctor, as the injury may have long-lasting effects on your life, possibly leading to depression and anxiety due to the disruption to your daily life. How is a whiplash injury treated? Most whiplash injuries get better on their own. However, during recovery, you may well need to take a few days off work, (if you have a particularly active or physical job you may need to take longer off). Your personal recovery period will, of course, depend on how severe your injury is. If you have a history of neck problems, then you may well experience an increased amount of pain. A number of self-care methods for improving your symptoms are recommended. For example, over-the-counter painkillers, such as paracetamol or ibuprofen and used regularly (as per the instruction and recommended dosage), these should help ease the pain in the majority of cases, but when the whiplash injury is more severe, your GP may recommend a stronger painkiller, such as codeine. One of the most important things you can do to help the recovery of a whiplash injury is to keep your neck moving gently. Resting your neck completely, for long periods of time, may increase the recovery time and exacerbate symptoms. So, gentle exercises will help reduce stiffness and improve movement. Early on, the exercises may be difficult and even slightly painful, but this is normal, and you won't cause any further damage by doing them. The use of neck braces and collars for soft tissue damage to the neck has largely been rejected as a useful treatment method as they make the neck immobile, restrict movement and slow down recovery. If your symptoms continue, then your GP may recommend you see a physiotherapist, who can advise you on further exercises and use other techniques such as a massage to help ease the pain. Is it worth claiming for a whiplash injury? While most sufferers will make a full recovery from whiplash symptoms using the treatment methods above, the injury can still affect their lives in many ways. Even when the symptoms are minor, many people struggle physically and psychologically with their injuries, meaning they have to miss work, which may mean they miss out on earnings, and this can create difficulties in their personal life. If your whiplash injury has impacted upon you or your family in any way, you shouldn't let yourself suffer without receiving the fair amount of compensation. Because everyone's situation is different, the effects of whiplash injury will differ greatly from case to case. Contact Thompsons today to discuss your individual circumstances with an experienced personal injury solicitor. How much whiplash compensation will I receive? The final sum awarded will depend on many different factors, including whether you've sustained any loss of earnings and to what extent the injury has impacted you psychologically. The following is a rough guide of the compensation amounts awarded to whiplash injury victims. full recovery between three months and a year – £1,860 to £3,300. full recovery within one to two years – £3,300 to £6,000. if the soft tissue injury heals within a period of months/years, but the injury remains vulnerable to further trauma – £6,000 to £10,450. if you've suffered a soft tissue injury or a wrenching-type injury, also if a disc lesion has caused limitation of movement and stiffness – £10,450 to £19,000. if fractures and dislocations in the neck and cervical spine have caused immediate symptoms and require treatment, also if there's soft tissue damage that permanently limits function – £19,000 to £29,250. More severe injuries involving damage to the back and spinal cord are generally assessed separately to the above model and often result in much higher sums. Click here to find out more about the factors affecting the amount of whiplash damages, and you can find out more about claiming compensation for spinal injuries here. Yes. Thompsons are personal injury specialists. We win more than nine out of ten cases we take to court, and we are confident that we'll be able to lead your claim to success. This is why we offer a No Win No Fee package. This package ensures that in the unlikely event your claim is unsuccessful, you won't be charged a penny. After all, if you've been unfairly injured in an accident that was caused by someone else, you deserve to be compensated, and we believe that you shouldn't be deterred from seeking compensation because of concerns over the financial risks. 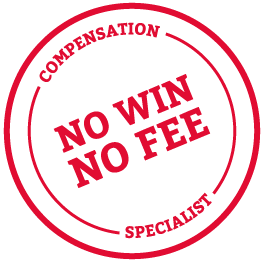 Who will pay the cost of my compensation? The party who pays your compensation will be the person or organisation determined to be liable for your accident. Because whiplash injuries are most commonly the consequence of a road accident, then the liable driver's motor insurer is likely to be responsible for paying the compensation. If the negligent driver does not have insurance, then a claim can be made through the Motor Insurers Bureau. Not necessarily. The vast majority of personal injury cases do not actually end up going to court. Litigating a case will lead to much higher costs for all involved, so it's usually much better for both sides involved to reach a settlement out of court. At Thompsons, we will always strive to settle the case as quickly and efficiently as possible, causing you the least amount of disruption and stress as possible (that said, we will continue to fight for your rights if we feel the defender has not put forward a fair offer). The more severe an injury is, the more likely it is that the case will proceed to court. As whiplash injuries are typically not severe injuries, going to court is often not needed. But there are some exceptions. For instance, if the defender continues to deny liability even though there is strong evidence against them that clearly shows they were liable, then we will raise action in court. Usually, the very act of raising court action will urge the defender to put forward an offer. Bear in mind that even if your whiplash injury case does end up going to court, Thompsons' No Win No Fee package will ensure you're fully protected from all legal costs and financial risks and we will explain everything fully before you make a decision about whether you want to proceed. How can I help my personal injury case? Regardless of whether you think you've suffered a whiplash injury immediately following the accident (remember that the true extent of symptoms will not be immediately apparent), it's important that you collect all the evidence you can while on the scene. This will help improve the chances of your case being successful as it will make it easier for us to prove the other party's liability. This means taking pictures of the collision scene, collecting all relevant details from the third-party driver, and, if possible, gathering witness statements. For more information on what will help your case, take a look at our information on what our personal injury solicitors need to know when you make a whiplash compensation claim. To allow us to make a fair valuation, we will usually instruct a medical report on your injuries. This will involve an examination by a medical professional so they can confirm the extent of your injury. What happens if I was partially liable for the accident? This is a common concern of many claimants. Accidents usually have many different contributing factors, so it's possible you may feel that something you did was a factor in the accident and, therefore, your whiplash injury. This is known as 'contributory negligence'. An example of contributory negligence would be if you weren't wearing a seatbelt at the time of the car accident, and your whiplash injury was made far worse because of it. If you're worried that you may be partly liable for your accident, you shouldn't let this stop you pursuing a claim. This is because there is a difficult legal test that the other party must meet before they can fairly place part of the blame on you. They must prove that your actions amounted to negligence and not just a slip in attention. Even if the other side is able to prove you were partially liable, you're still entitled to compensation. What it will mean, however, is that the compensation award is split. It will be up to the court to decide your percentage of liability. So, if you're found to be 50 per cent liable, you'll receive 50 per cent of the damages you would otherwise be entitled to. If you're determined to be 25 per cent liable, you'll receive 75 per cent of the damages, etc. Why should I make a claim with Thompsons? Thompsons Solicitors is one of the most reputable personal injury law firms in Scotland. We pride ourselves on helping individuals, not big businesses, and we recover more than £1 million every week for our clients. We've helped obtain justice for victims in a number of high-profile cases and have always been heavily involved in campaigning for the improved safety of road users, so much so that our hard work has been recognised by the road safety charity Brake. You can rest assured that your whiplash injury compensation claim is in safe hands with Thompsons. Can I claim if I live outside Scotland? Yes, you can. In fact, we have many claimants who now live abroad in locations such as France, South Africa, and Australia. If you worked or lived in Scotland before you moved overseas, you can bring a claim for compensation in the usual way. I want to make a claim. What is the first step? To begin the personal injury claims process with Thompsons, call us today on 0800 0891 331 for an initial discussion. This conversation will give us a better idea of your case and its chances of success, and we'll recommend whether we feel it's worth moving forward.